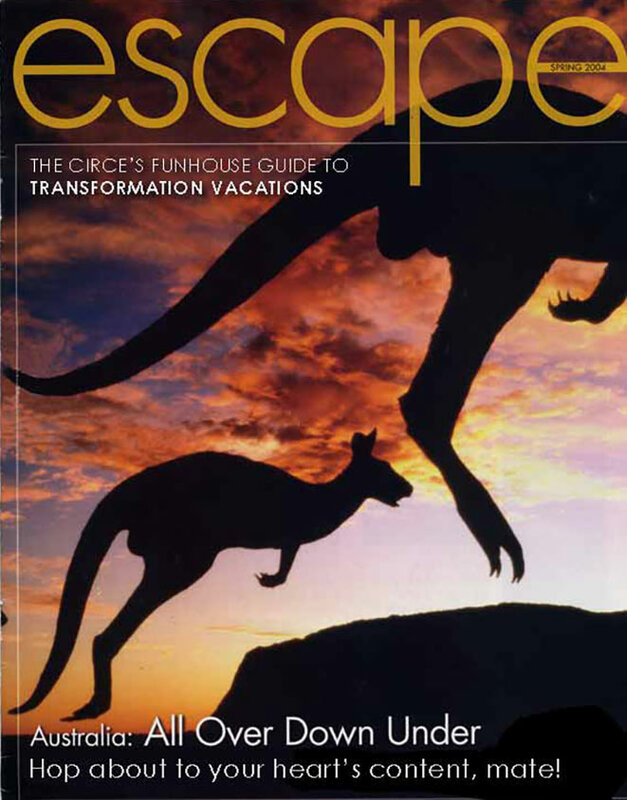 One of the few actual rides in Circe's Funhouse, the deceptively simple-in appearance Roo-Go-Round resembles a miniature child's carrousel, except that a quartet of oversized, hydraulically-powered sculptured kangaroos replace the traditional equine steeds. 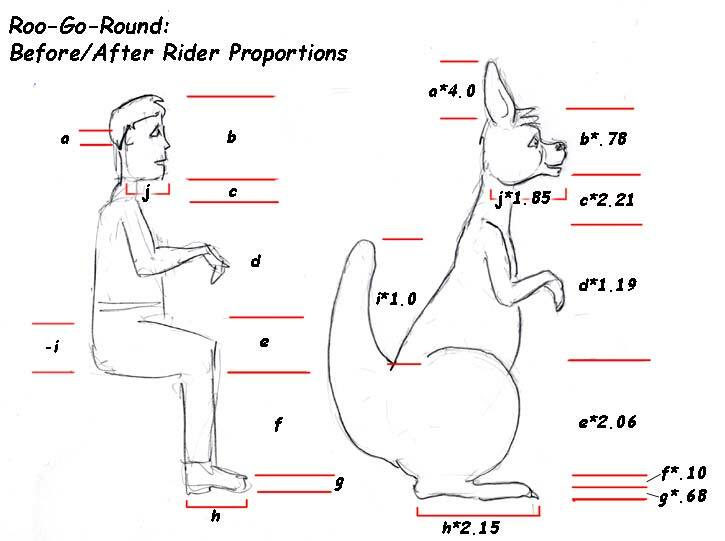 Once the passenger is firmly ensconced in the roo's pouch-seat, the ride employs a transmogrifying, enchantment-enhanced combination of torque, acceleration and centrifigual force -- not merely to transform him, but to imbue the very core of his being with the irresistible desire to indulge in the bounding leaps that will irreversably mark him as a true member of his new species. 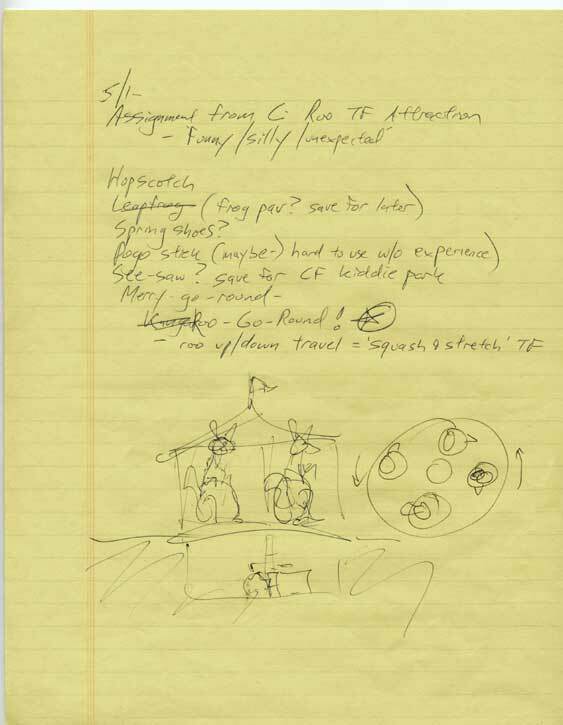 Circe's Funhouse recently discovered the original conceptual and design plans for the Roo-Go-Round in the Funhouse archives, as created by her feline changeling Patches! 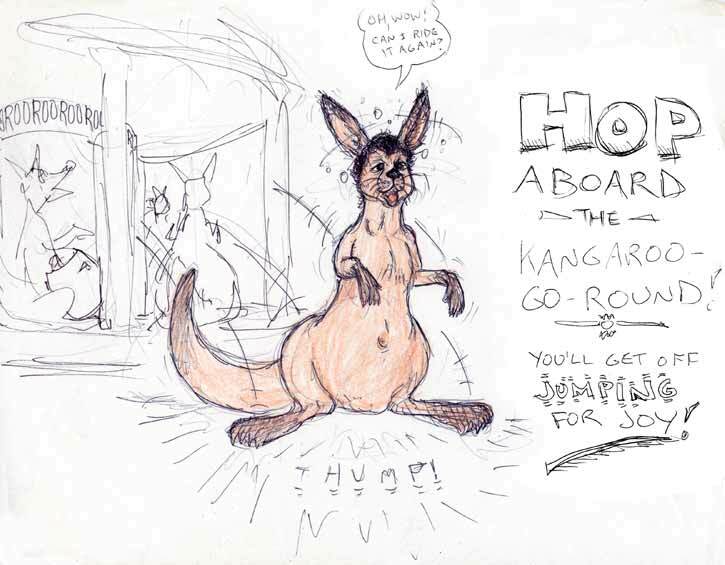 Assigned by Circe to create a kangaroo-themed pavilion, Patches decided to apply animated cartoon 'squash and stretch' principles to the transmogrification process. 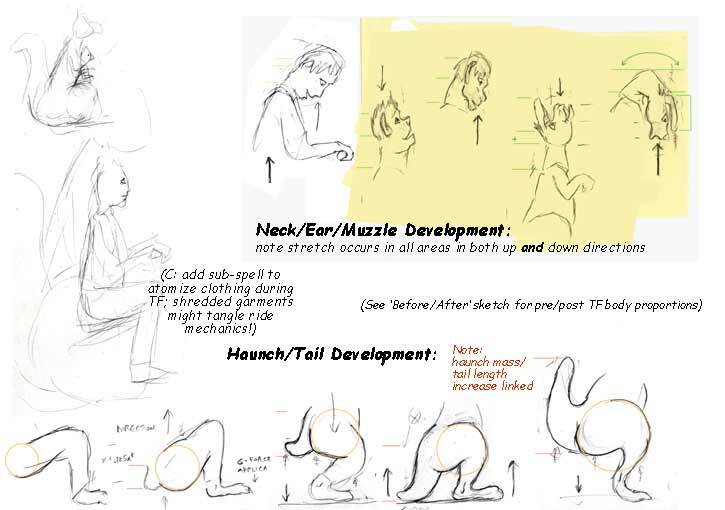 In animation, characters respond to gravity, acceleration and impact with temporary bodily reformation - stretching out with leaps and falls, or compacting upon impact with surfaces. 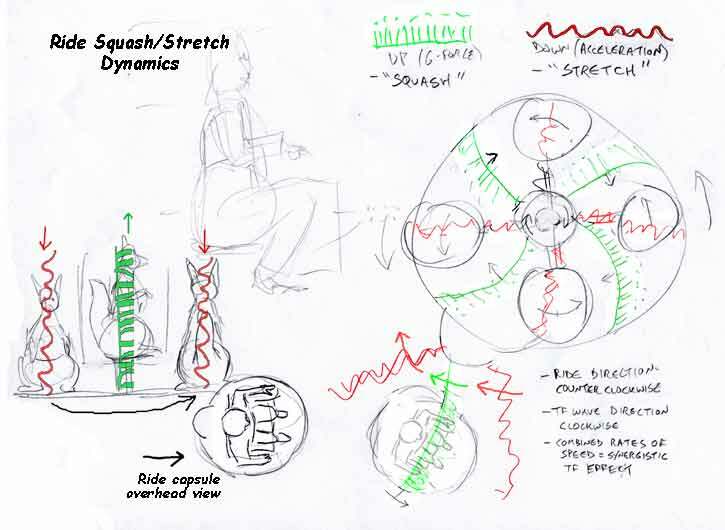 In a flash of inspiration (and to satisfy Circe's preference for deceptively innocent-looking transformation enticements), Patches decided to remake the classic merry-go-round into a literal vehicle of transformation - a mechanism that would harness these forces and imbue them with Circe's magic to 'squash and stretch' the human body into marsupial form - permanently! Why not try a Transformation Vacation? revised image! - Another Satisfied Customer - revised image! Taking another cue from real-world theme parks, Circe has just installed an automatic camera on the Roo-Go-Round. Now, when your ride is over and you leap out of your enchanted Roo steed, the camera captures your image just at the moment you realize you feel kinda... different. Your picture is instantly developed, placed in a handsome frame, appropriately captioned and waiting for you at the photo booth adjoining the Roo-Go-Round - a memory of your visit to Circe's Funhouse for you to enjoy forever (along with your new body)! 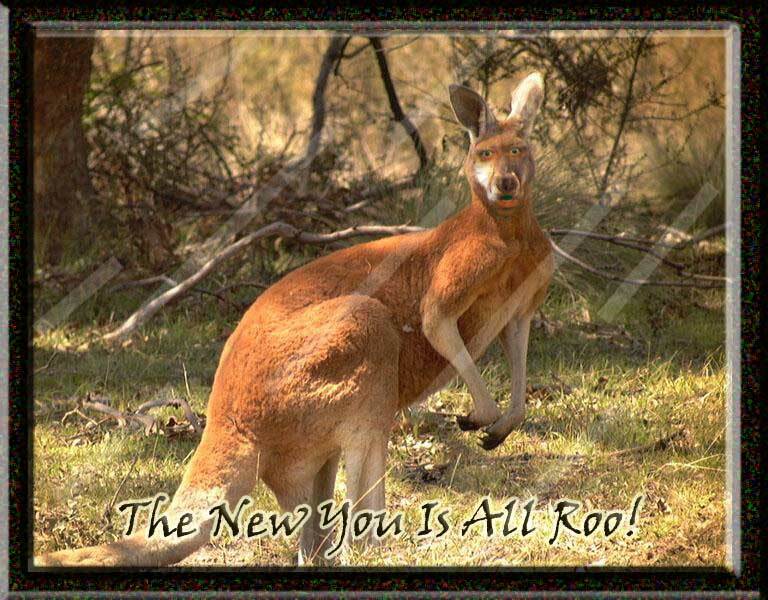 It's True, You're A Roo -- The Joke's On You!